My nominee for “worst tagline of 2016” comes from the cover of Flight 7500. The box tells us that “there are forces more terrifying than turbulence”. Well, duh – I worry a lot more about some terrorist blowing up my plane than a few bumps along the way. 7500 takes a more supernatural view than the one cited in my fears, though. Flight 7500 leaves LA to fly to Tokyo. Along the way, the plane encounters severe turbulence and a passenger dies. Additional problems ensue even after this man’s demise, though, and they wreak havoc throughout the flight. We follow the passengers and crew as they attempt to piece through the truth behind the mayhem. When the press release for 7500 appeared, I didn’t intend to review the film, but I noticed that it came from Takashi Shimizu, the director of 2004’s The Grudge. While I wasn’t wild about the film, I thought it showed potential, so I figured Shimizu’s presence behind the camera might make 7500 more interesting than the low-budget direct-to-video fare it seemed to be. And I think 7500 does improve on what I expected, though it does suffer from a certain sense of cheapness. Apparently 7500 was intended for release all the way back in 2012 but sat on a shelf for all these years. I don’t know what prompted the delay, but I get the impression that the version we see may not offer a totally-finished product. By that I mean that I suspect the studio abandoned the project before the filmmakers could refine it and make it more of a multiplex-worthy flick. This impression comes partly from the lackluster effects, as 7500 suffers from some seriously tacky visuals. Exterior shots of the plane look like outtakes from some 1970s disaster movie, and supernatural elements also display a decided lack of polish. These factors make the movie seem more amateurish than I’d expect. Even with those flaws, though, 7500 manages to provide a reasonably intriguing effort. In a surprising move, it takes its cues from old Hollywood disaster movies like Airport and The High and the Mighty more than from horror fare. 7500’s first act plays like soap opera to a degree, as we meet many of the passengers and get their backstories. This clearly evokes memories of the films I mentioned and creates a different emphasis than I’d expect from a supernatural horror experience. For the most part, this choice works. While the characters don’t get a ton of exposition, we learn enough about them for the movie to develop, and these choices benefit the story in the end. For a while, I felt perplexed that the filmmakers devoted so much time to the passengers’ tales, but these moments make sense by the conclusion. I’ll also say this for 7500: it proceeds down paths that differ from what I expected based on synopses and promotional materials. While the film takes a supernatural bent, it doesn’t do so in the manner I anticipated. Whether or not that’s a good thing depends on the viewer’s POV, I guess. I think the conclusion doesn’t seem tremendously original, but it works moderately well. At least the movie comes with some emotion at its end, whereas a straight “ghost story” might’ve been less compelling. At no point can I claim that Flight 7500 turns into a great film, but it does fine for itself. The movie maintains a creepy tone and keeps the viewer with it, factors that make it a watchable 80 minutes. Flight 7500 appears in an aspect ratio of approximately 1.78:1 on this single-sided, double-layered DVD; the image has been enhanced for 16X9 televisions. For an SD-DVD, this seemed like a pretty good presentation. Sharpness worked fine. Occasional instances of softness crept into wider shots, but most of the film displayed positive delineation. No jagged edges or shimmering occurred, and edge haloes remained absent. No problems with source flaws caused distractions, as the movie remained free from defects. With a subdued palette at work, not many colors cropped up in 7500. Within those parameters, the colors were fine. Blacks remained acceptably dense, and shadows were clear and smooth. This was a “B+” presentation. As for the Dolby Digital 5.1 soundtrack of Flight 7500, it worked pretty well. While the soundfield didn’t go nuts throughout the film, it kicked into action well when it mattered. During quieter scenes, the mix boasted good environmental material, and more active sequences delivered fine immersion and punch. The latter provided the muscle that we expected and used the five speakers in an involving manner. Overall, audio quality appeared good. Speech came across as distinct and well represented. Music presented good dynamics via the score; the music was tight and full. Effects came across as accurate and firm, with clean highs and deep bass. The soundtrack fell short of greatness, but it mostly served the film well. A featurette called Inside Flight 7500 runs four minutes, 39 seconds. It includes comments from director Takashi Shimizu and actors Leslie Bibb, Amy Smart, Ryan Kwanten and Jamie Chung. The show covers story/character areas, sets and shooting challenges. While not a deep program, a few minor details emerge – with a ton of spoilers, so don’t watch “Inside” if you’ve not seen the movie itself yet. The disc opens with ads for Backtrack, The Last Exorcism Part II, Z for Zachariah, The DUFF, Maggie and Knock Knock. No trailer for Flight 7500 appears here. 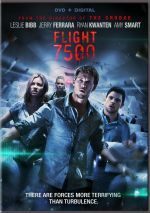 As far as supernatural horror goes, Flight 7500 falters at times, but it fares well in other ways. Though the movie can feel derivative, I think it musters enough morbid energy and mystery to remain interesting. The DVD provides pretty good picture and audio but lacks notable supplements. Don’t expect a classic from 7500, but I feel it delivers a decent twist on the airplane-based disaster genre.